Abstract: Lobate and helical ichnofossils attributable to Zoophycos found in Middle Cambrian shales of the Palác Hill in the Železné Hory Mountains (eastern Bohemia) represent the oldest occurrence of this ichnogenus. Such a complex Zoophycos became frequent during the Mesozoic but has been never recorded in strata older than the Ordovician. As such, they represent the oldest occurrence of helical Zoophycos. Besides Zoophycos isp. there is also a 15 cm thick sandy siltstone layer which is strongly bioturbated by Planolites isp., which seems unusual in a Lower Cambrian ichno-association. Abstract: Recently two new trilobite occurrences were discovered during geological mapping of fossiliferous shales of the Březina Formation around the village of Březina in the Moravian Karst (Czech Republic). The newly discovered localities are extraordinary because of the unexpected occurrence of articulated trilobite exoskeletons associated with brachiopods including supporting spines. The new atheloptic association of Mississippian trilobites is described for the first time from the Moravian Karst. Abstract: Hydrothermal mineralization hosted by the Lower Cretaceous igneous rock of the teschenite association at Jasenice (Silesian Unit, Flysch Belt, Outer Western Carpathians) occurs in two morphological types – irregular vein filled by granular calcite and regular composite vein formed by both fibrous and granular calcite and minor chlorite, quartz, and pyrite. Crosscutting evidence indicates that the granular veins are younger than the composite vein. The composite vein was formed by two mechanisms at different times. The arrangement of solid inclusions in the marginal fibrous zone suggests an episodic growth by the crack-seal mechanism during syntectonic deformation which was at least partially driven by tectonic suction pump during some stages of the Alpine Orogeny. Both the central part of the composite vein and monomineral veins developed in a brittle regime. In these cases, the textures of vein suggest the flow of fluids along an open fracture. The parent fluids of both types of vein are characterized by low temperatures (Th = 66—163 °C), low salinities (0.4 to 3.4 wt. % NaCl eq. ), low content of strong REE-complexing ligands, and δ18O and δ13C ranges of + 0.2/+12.5 ‰ SMOW and —11.8/—14.1 ‰ PDB, respectively. The parent fluids are interpreted as the results of mixing of residual seawater and diagenetic waters produced by dewatering of clay minerals in the associ- ated flysch sediments. The flow of fluids was controlled by tectonic deformation of the host rock. Abstract: Hemipelagic green clayey shales and thin muddy turbidites accumulated in a deep sea environment below the CCD in the Skole Basin, a part of the Outer Carpathian realm, during the Middle Cenomanian. The hemipelagites contain numerous radiolarians, associated with deep-water agglutinated foraminifera. These sediments accumulated under mesotrophic conditions with limited oxygen concentration. Short-term periodic anoxia also occurred during that time. Muddy turbidity currents caused deposition of siliciclastic and biogenic material, including calcareous foramini- fers and numerous sponge spicules. The preservation and diversity of the spicules suggests that they originate from disarticulation of moderately diversified sponge assemblages, which lived predominantly in the neritic-bathyal zone. Analyses of radiolarian ecological groups and pellets reflect the water column properties during the sedimentation of green shales. At that time, surface and also intermediate waters were oxygenated enough and sufficiently rich in nutri- ents to enable plankton production. Numerous, uncompacted pellets with nearly pristine radiolarian skeletons inside show that pelletization was the main factor of radiolarian flux into the deep basin floor. Partly dissolved skeletons indicate that waters in the Skole Basin were undersaturated in relation to silica content. Oxygen content might have been depleted in the deeper part of the water column causing periodic anoxic conditions which prevent rapid bacterial degra- dation of the pellets during their fall to the sea floor. 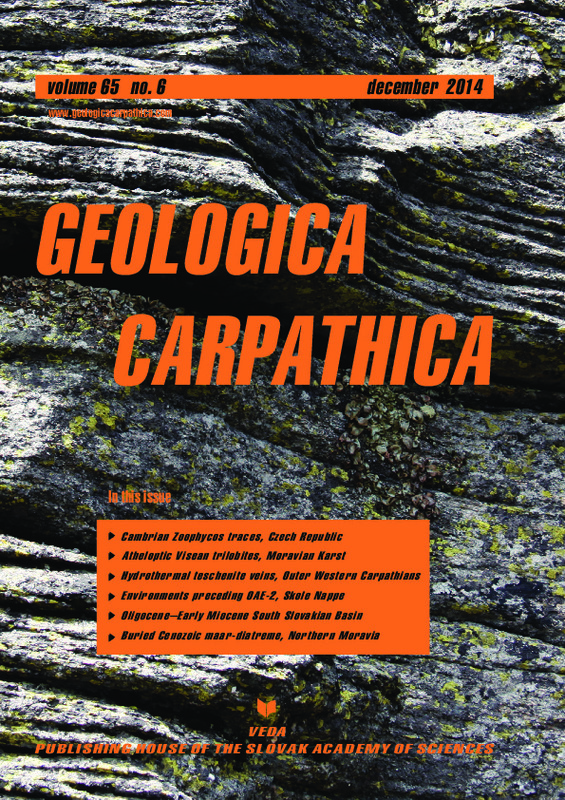 Abstract: Oligocene and Lower Miocene sediments of the Lučenec Depression were studied to demonstrate the plank- tonic bioevents and climatic proxies from the Číž Formation (Rupelian) and Lučenec Formation (Chattian—Aquitanian) on the basis of quantitative analyses of foraminifers and calcareous nannofossils. The oldest nannofossil assemblages of the Číž Formation belonged to the NP23 Zone and were dominated by Reticulofenestra ornata known for preference of temperate eutrophic water conditions. An increase in bioproductivity was documented by abundant large-sized plank- tonic foraminifers (e.g. Turborotalia ampliapertura, Paragloborotalia nana, Subbotina gortanii) and epifaunal to shal- low-infaunal benthic species. The middle part of the Číž Formation reveals a lowstand progradation of deltaic sediments of the Rapovce Member. There, the planktonic foraminifers are impoverished in both size and diversity, containing mostly tenuitellid and cassigerinellid species, probably as a result of decreased salinity and increased anoxia in the Tard Clay. Contrary of this, the benthic foraminifers are rich, mainly the infaunal forms of uvigerinid species. They probably proliferated due to a high organic flux from riverine input. Open marine conditions were restored in the upper part of the Číž Formation above the lowest occurrence (LO) of Cyclicargolithus abisectus on the NP23—NP24 zone boundary. The transitional interval between the Číž and Lučenec formations (O5/O6 – NP24/25) was approximated by the HOs of Paragloborotalia opima and Sphenolithus distentus and the LOs of Globigerinoides primordius and Pontosphaera enormis. Benthic foraminifera of the Lučenec Formation indicate a high productivity and oxygen-deplected environ- ments. The Oligocene—Miocene boundary in the Lučenec Formation was appointed by the HOs of Helicospahera recta and Dictyococcites bisectus. Foraminiferal markers of this boundary were established from the HO of Globigerina ciperoensis and the LO of G. ottnangiensis. The highest nannofossil dating in the Lučenec Formation is recorded by the LOs of Helicosphaera mediterranea (NN1 Zone) and Discoaster druggi (NN2 Zone). The uppermost part of the Lučenec Formation contained many Paratethys benthic foraminifera, such as Uvigerina posthantkeni. Abstract: The maar-diatreme volcanic structure in the vicinity of the village of Lomnice near the town of Bruntál (North Moravia, Czech Republic) has been investigated using a set of geophysical methods including ground magne- tometry, gravimetry and electrical resistivity tomography. The structure was detected by an aerial magnetic survey in the second half of the 20th century. Since its discovery only limited information about this buried structure has been available. The coherence of the magnetic anomaly of 190 nT and Bouguer anomaly of —4.7 mGal indicates a volcanic origin of the structure. The funnel-shaped maar-diatreme structure is filled with lacustrine clay and colluvium of Car- boniferous greywacke, which forms the country rock. The surface diameter of the structure is about 600 m, the depth is more than 400 m. The spatial association with other volcanic centers in the surroundings of the town of Bruntál infers the relative dating of the Lomnice maar. The phreatic eruption and maar-diatreme formation could be an indirect conse- quence of effusive activity of the nearby Velký Roudný volcano. The Lomnice structure is the first Plio-Pleistocene maar-diatreme ever described in North Moravia and Silesia.